Ecology and Life History Overview: This small, but stunning moth is found in Southeastern Arizona down through parts of Mexico. Unlike many other members of it’s genus that feed on plants in the Onagraceae, this species feeds on only a few species of Boerhavia in the Nyctaginaceae. This moth tends to fly during the late afternoon, and can be found nectaring at flowers then. They will come to light traps, but only usually right at dusk. In Arizona, this moth is linked to the monsoon seasons and can be found throughout the various mountain ranges in Southeastern Arizona. Habitat and Searching for Larvae: In certain locales in Southeastern Arizona, this moth can be quite common. In the Peña Blanca, dozens of this species can be encountered in all life forms along the dry-washes where Boerhavia coccinea grows prolifically. Because eclosion of pupae is stimulated by the monsoons, missing the peak emergence of this species can be quite easy. 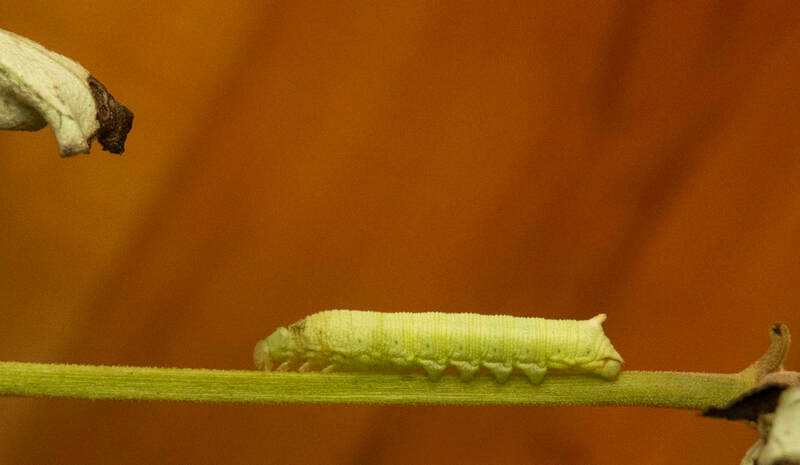 Larvae are quite conspicuous on their hostplants. 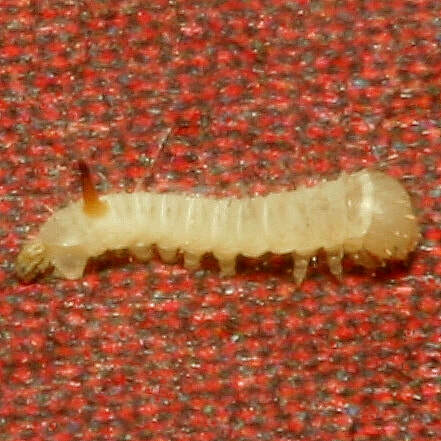 In one small area, a 5th, 4th, 3rd, and 2nd instar larva were recovered. This was quite a surprise given the wide range of life-stages, but it was evidence we missed the adult flight. The fully grown larvae tend to sit in the middle, densest part of the plant. 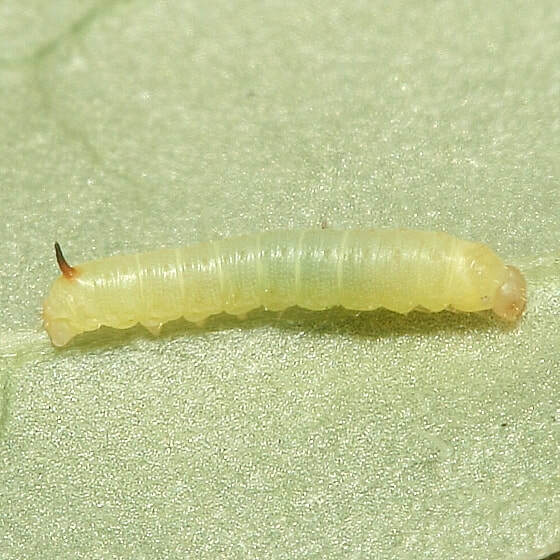 Younger larvae are perfectly content on the stems of the plant, or underneath the leaf on the mid-vein. The larvae do not fluoresce using ultraviolet flashlights, but shining the light on the plants does make them stand out a little bit more than usual. Rearing Notes: Very easy to rear if you have access to one of the three species of Boerhavia they rely upon. Larvae can be fed cut food in tupperware. You will have to replace food fairly often as Boerhavia doesn’t hold well when cut. Presumably, an easier method of rearing would be to plant window-box or similar sized bed of Boerhavia and allow the larvae to feed directly on the plants. Pupation is incredibly easy and larvae had no problem pupating in slightly damp paper towels or in slightly damp soil (1). Adult description: This is a very small (FW length 14-20mm (2)) green sphingid. This species can be separated from others in the genus by having nearly uniformly colored green forewings. 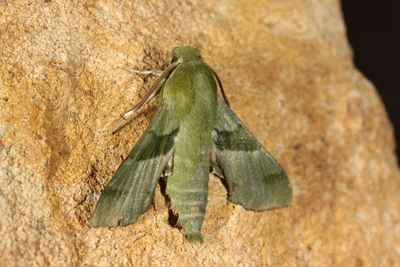 There is a darker green patch that runs from the costa to the inner margin on each of the forewings. The hindwings are red with a black and greenish streaked outer margin. The combination of the small size and primarily uniform color makes it easy to separate from other species. Eggs: Are very small. They tend to be light green, ovular and have a bit of a divot on the top. 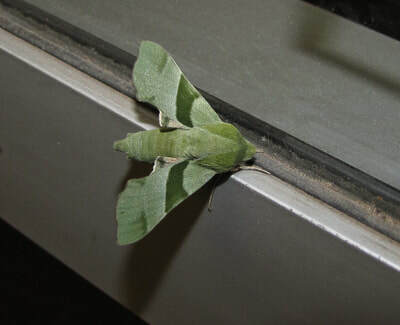 L2: Still very small, the larva has taken on a more green-gray translucent appearance. The very short, straight orange caudal horn is still there, but now tipped in black. The larvae at this stage can be found hidden underneath the leaf veins during the day. L3: Third instar larvae are decidedly more green. The caudal horn is now plain orange, but is much more reduced, barely the same size as one of the larva’s thoracic legs. It is a fairly unremarkable larva at this point, just rather plain green. At this stage, larvae are often seen sitting on small stems, or the mid-vein underneath leaves on plants. 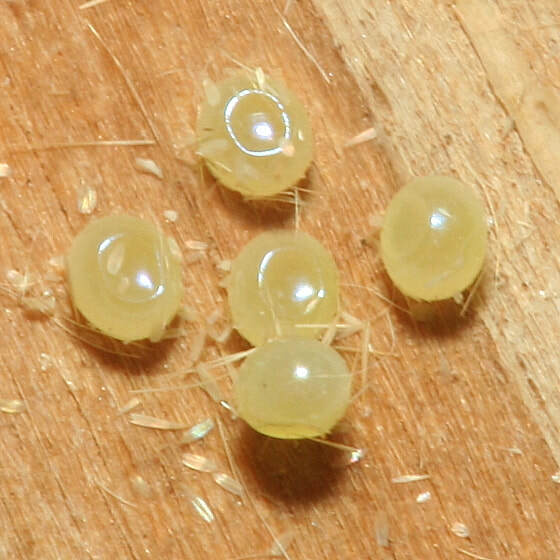 L5: Final instar Proserpinus terlooii can be quite variable. All of the forms have a large black “eyespot” around each spiracle. Sometimes this spot is more of a black circle, especially in the plain green form, and sometimes it’s a more developed eyespot. The plain green form of the larva is still quite striking due to the black spots around the spiracles. The green ground color of the larva is often very muted, and tends to match the hostplant quite well. Another form is the bicolored form where the entire dorsal region of the larva is dark (usually black or brown) and the ventral half of the larva is cream (or lighter in contrast) colored. These two colors meet around the spiracles which are surrounded by more well-defined eyespots, enhanced by the more orange colored spiracles. These two forms have intermediate steps as well, but the combination of larva having large black circles around the spiracles, and a very short cream/orange nub of a horn makes it easy to identify. The gallery to the left contains photos of Proserpinus terlooii adults. The data for each photo can be found by clicking on it. If you have a photo that you would like to submit to us, please contact us. The gallery to the right contains photos of Proserpinus terlooii larval and pupal stages. The data for each photo can be found by clicking on it. If you have a photo that you would like to submit to us, please contact us.